Welcome to Online Puzzle Test in our official website-studyvirus.com. 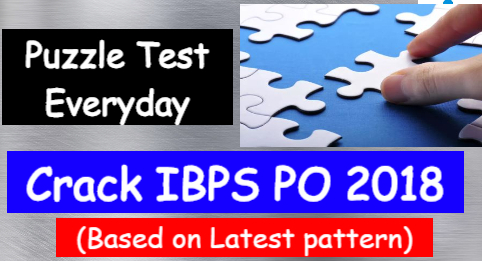 We are going to organize Quizzes of most important questions for upcoming IBPS PO Prelims 2018 Examination.All the questions will be completely based on the latest pattern and these questions will surely help you to crack IBPS PO exam. Don’t forget to share your marks in the comment section after writing the test. Get IBPS PO and Clerk (Prelims+Mains) Online Test Series at the most affordable price.Click here. Give Free Quizzes and get important materials (PDFs,e books,etc) on our Mobile App-Study Virus(Android/IOS).Click here to download. Subscribe our Youtube Channel for Important Banking and SSC videos.Click here to Subscribe. 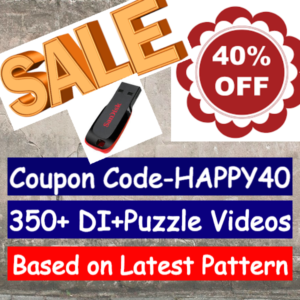 Get the Best Selling Pen Drive Video Course on Data Interpretation and Puzzles (350+ Videos,PDFs) to crack IBPS PO/Clerk 2018.Get Flat 40% discount (Coupon Code-HAPPY40) right now.Click here. Prepare well,Keep Working Hard and never Give Up !! Chemistry is taught by B on Tuesday. D teaches on Friday but neither Geography nor Physics. F teaches History but neither on Thursday nor on Friday. A teaches English on the day on which History is taught. C teaches Maths on Monday and G teaches on Thursday. Geography and Chemistry are taught on the same day. Which of the following subjects is taught by G? On which days is only one subject taught? English is taught on which day? Which of the following teachers teach on Tuesday? 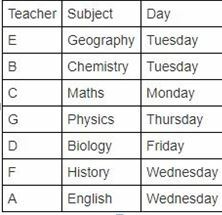 Which subject is taught on Friday? A, B, C, D, E, F, G and H are sitting around two circular tables in two different rooms of the same house. In one room four persons are sitting facing towards the center while in the other four people are sitting facing away from the center. Both the tables are kept along the wall joining the two rooms. The table around which people are sitting facing towards the center is placed to the left of the wall joining the two rooms. The positions of four chairs around both the tables are towards cardinal directions. • A is facing the center. • E is sitting between G and H.
.•H is sitting near the wall with his back towards the wall. • C is facing away from the wall joining the two rooms. • The positions of the chairs on which A and F are sitting are same. Who is sitting in the same position as that of B in the other room? If H changes his position with C, who will now sit to the immediate left of C? What is the position of B with respect to F?